Test Lab: The Whitening Toothpaste with Real Results - Luster's Power White | Valet. When a celebrity groomer who gets dudes ready for red carpets raved about this award-winning (but relatively unknown) brand, we figured it was worth a test. 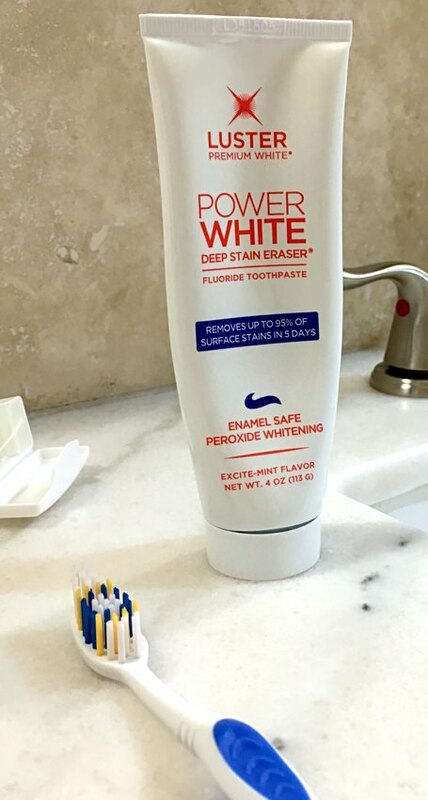 Developed by dentists, Luster's Power White ($6.79) is a two-in-one product that not only erases stains but is also an enamel-strengthening daily fluoride toothpaste as well. A few of us, each with different goals of brightening up our smiles, used this as our primary toothpaste—brushing both in the morning and before bed. The first thing we all noticed was the taste. If you're used to sweet, extra minty gel toothpastes, then this will taste a bit bland and slightly medicinal. And you'll likely notice some extra foaming, thanks to the 2% stabilized hydrogen peroxide used as the whitener. But it'll be worth it. We also made sure to brush for the full, dentist-recommended two minutes to get the full effect. After just seven days of brushing, each of us saw definitively brighter smiles. One tester, who had whitened his teeth before, experienced the most dramatic lightening. But a whitening virgin also happily reported a noticeable boost in brightness and reduction in dark staining. All without any teeth or gum sensitivity—a big plus for anyone who's suffered through post-whitening pain in the past. Another plus? This stuff really polishes your teeth too. They look and feel extra clean and the shine makes them look even whiter. While flossing and brushing after each meal is ideal to prevent staining, the very least you can do is rinse your mouth with water immediately after you've eaten dark, staining foods. The next best thing to rinsing? Chewing sugarless gum. Experts weigh in with some simple, surprising and effective ways to brighten your smile. Is this affordable electric toothbrush the last one you'll ever have to buy? We're thinking the answer is likely yes.